One beautiful afternoon I was flying across the Mojave Desert while chasing a storm front from the Sierra Nevada Mountains in eastern California across Death Valley in Nevada and then all the way across the Mojave Desert into Arizona, just to the west of the magnificent Grand Canyon National Park. When I arrived just to the west of the Colorado River on the border of Nevada and Arizona I was flying along the river as this beautiful line of clouds began to take form over the First Nations Hualapai Reservation that straddles the western side of the Grand Canyon near Grasshopper Junction, Arizona. 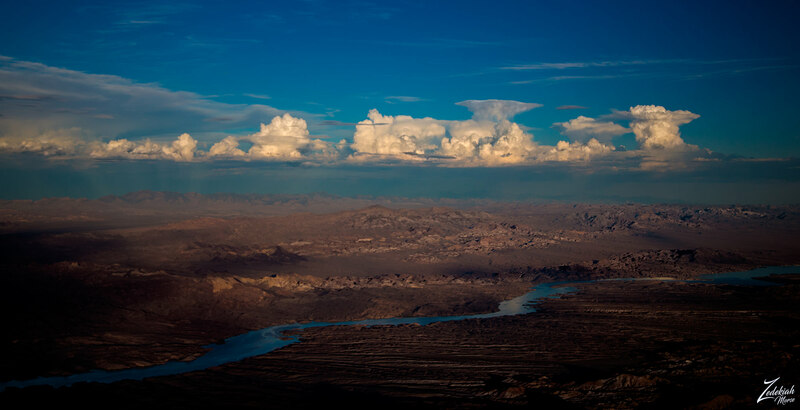 As I flew around in a wide circle over the Colorado River I was shooting a number of different subjects while at the same time I kept a lookout on these anvil clouds forming in the distance. Every time I would complete a circle and come back to the same relative spot over the Colorado River I lensed a photograph, for a total of four images. The overall time lapsed in between each of these four photographs is about twenty minutes so from the first shot till the fourth shot it is about eighty minutes in total. As you can see from the first image in this series, it was at the end of the day, during the waning dusk hour and the alpenglow effect was beginning to shift the color hues with the dimming light. In this image above, on the bottom sides of the image, you can clearly see the shadows cast across the desert floor from the Eldorado Mountains behind me to my west. The sun is setting in the west and the long shadows in combination with the shifting colors of the sunset begin to play with the scene in a beautiful way. In this second image, the alpenglow effect is becoming more pronounced and dramatic along the surface of the Mojave Desert floor. The shadows from the Eldorado Mountains behind me to the west are more dramatic and are covering much more area as the sun dips lower towards the horizon on the other side of the mountain range. Also, notice the clouds are becoming slightly more amber colored at their base as the golden hues from the alpenglow begin to climb up from the desert floor to begin interacting with the base of the clouds. The anvil shape on the clouds are becoming more pronounced and have begun to fan out as they hit the different mass of air up at altitude. In this third image, the sun has dropped even lower over the horizon and you can only see slivers of alpenglow light coming across the desert floor while the clouds up above are becoming brighter as the sunlight begins to shift upwards and focus its light at the base of the clouds. The anvils on top are also becoming more pronounced as they fan out across the high-level stratosphere. 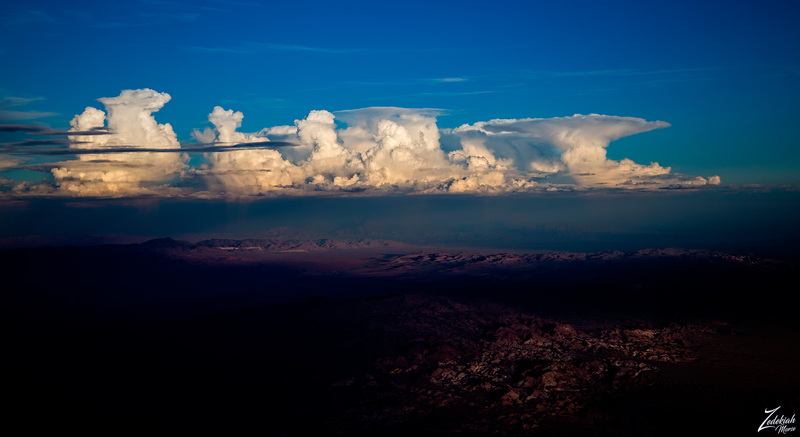 Anvil clouds are also technically known as cumulonimbus incus (incus, is Latin for “anvil”). They are cumulonimbus clouds which have reached the level of stratospheric stability which causes them to form the characteristic flat, anvil-top shape as seen in these images. When the clouds tower up and then begin to flatten out as in these images, it signifies that the thunderstorm making up these clouds has entered its mature stage, meaning succeeding the cumulonimbus calvus stage. Cumulonimbus incus is a sub-form of Cumulonimbus capillatus. 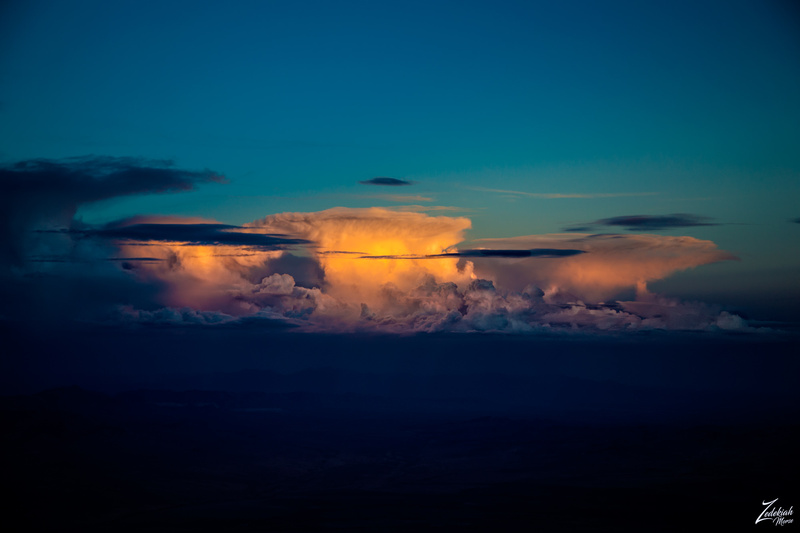 Zedekiah: When flying in a small bush plane as I am when around these weather phenomenon one must always remember that these cloud formations, while dramatically beautiful and awe-inspiring, are also very dangerous. 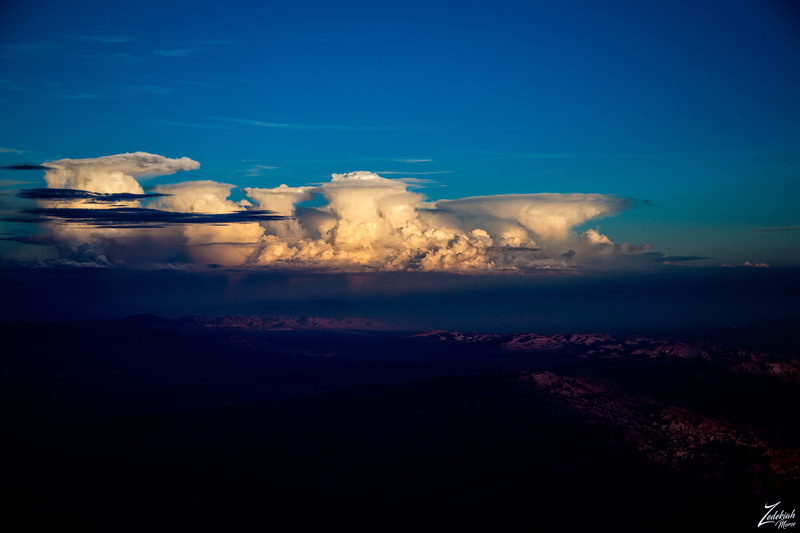 A cumulonimbus incus cloud formation is a mature thunderstorm cloud generating many dangerous elements. Lightning; this storm cloud is capable of producing bursts of cloud to ground lightning. Hail; hailstones may fall from this cloud if it’s a highly unstable environment (which favors a more vigorous storm updraft). Heavy rain; this cloud may drop several inches of rain in a short amount of time. This can cause flash flooding. Strong wind; gale-force winds from a downburst may occur under this cloud. Tornadoes; in severe cases (most commonly with supercells), it can produce tornadoes. Cumulonimbus clouds can be very powerful. If the correct atmospheric conditions are met, they can grow into a supercell storm. This cloud may be a single-cell thunderstorm or one cell in a multicellular thunderstorm. They are capable of producing severe storm conditions for a short amount of time. In this last image of this series the sun has completely set over the horizon behind me to the west and now the remaining alpenglow light effect has cast its focus completely on the center of the cloud mass. Due to our relative position in a line between the sunlight behind me and the closest cloud front to me it is causing the towering Cumulonimbus cloud in the center of the formation to glow a vibrant amber color. What I love in particular about this image is the dark desert floor, totally unseen by lack of light, juxtaposed against the brilliant multi-blue hues of the sky above the clouds and then the various shades of magenta and purples in the dark thunderclouds along the base of the entire range of anvil clouds. Open these images full screen to see this in more detail. Also if you will notice, in the first three images there are clearly four anvil clouds to be seen but now with the sunset behind the mountains behind me to the west, the anvil on the far left in the image is obfuscated by the high mountains on the horizon over 100 miles behind me. I love long distance atmospheric effects! !